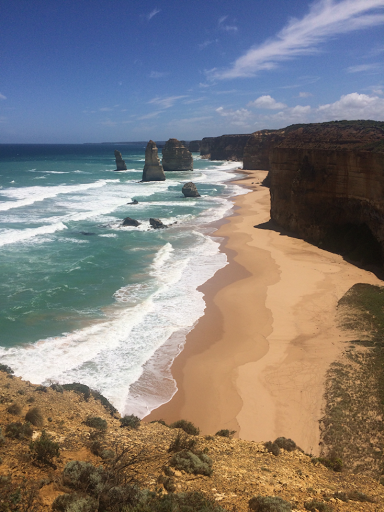 The Belgian and The Aussie: Mornington Peninsula and the Great Ocean Road. Mornington Peninsula and the Great Ocean Road. What a week! We have done so much in the last week, it's been wonderful, and the weather has improved. A week ago we were lingering at the upper edge of the Mornington Peninsula. Lingering because it was the weekend and we were headed for some top tourist attractions and preferred to linger so as to skip the weekend crowds. The ferry from Sorrento to Queenscliff is 40 minutes and saves one from driving around Port Phillip Bay, which would involve travel through Melbourne. We don't like visiting cities in a motorhome, so we tend to avoid them. And this was an easy option. Queenscliff is a charming town with some stunning old buildings which I think many might overlook in their rush to get to the famous Great Ocean Road. The Great Ocean Road (GOR) is stunning. It's possible to do it in a day, but we spent a night camped at each end and two in the middle. And, we even managed free camping at both ends (rare finds on the GOR), and spent those two middle nights camped under Koalas in a place called 'Bimbi Park'. Doing each and every viewpoint (and it seems like we did) means that you do quite a lot of walking. Each viewpoint seems spectacular in its own way, and, although we got to feeling like we'd had enough we still did more and were never disappointed by any of them. 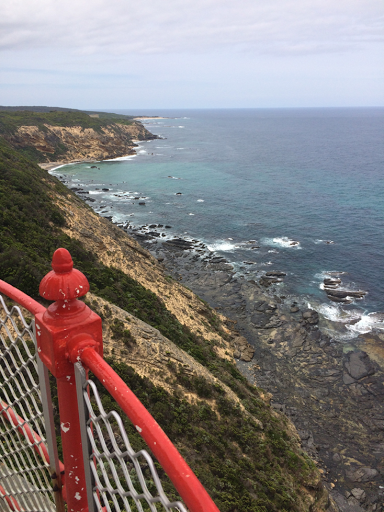 Near Bimbi Park is the Cape Otway Lighthouse. It has great displays and informative talks. 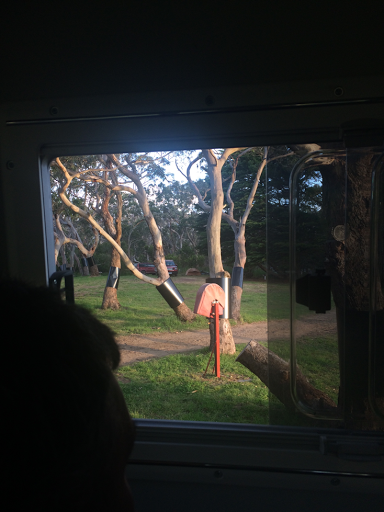 Looking out our RV window in Bimbi Park we could see Koalas. Check the 1st fork of the right tree. Just one view on the Great Ocean Road: The Twelve Apostles.